Saturday mornings are slow and pleasant — I listen to one of my favorite radio programs while I check what new books Gutenberg has published. 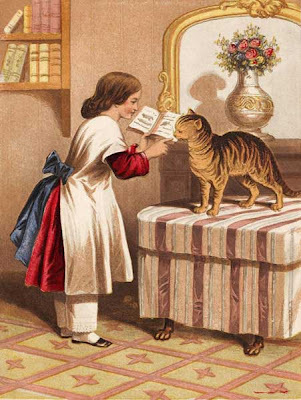 Some of the books are a tad too edifying but I can't resist them if they have good pictures — like the one above from "Pretty Tales for the Nursery" by Isabel Thompson with illustrations by John Gilbert (1817-1897). It doesn't say when it was printed but as the illustrator died in 1897 and he was rather old then one can assume that it was printed well before the end of the century. There were three books illustrated by Walter Crane which I of course could not pass. It is still snowing but I think it soon will turn into rain — a perfect day to stay by the fire to read and listen to music. I've just started to read a book I found last Saturday: "Northern Travel Summer and Winter Pictures of Sweden, Denmark and Lapland" by Bayard Taylor. It was printed in 1857 so even if I've been to many of the places he picture I won't recognize them.